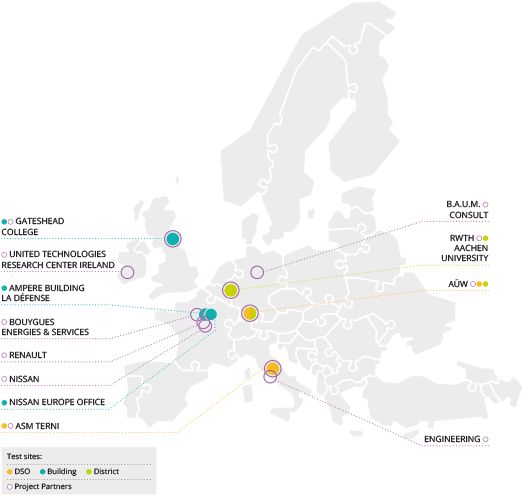 The consortium involved six test sites in four EU countries in order to cover all the relevant applications for distributed storage from an office building to a university R&D center or a local grid with solar energy generation. The storage systems are directly connected to feeders or substations and include a storage management system capable of providing solutions for autonomous storage management and also to interface the storage system with wider scale energy managers. This storage management brings a comprehensive approach to all storage capacities. Installed in commercial and industrial buildings it is able to interact with the Building Energy Management Systems (BEMS) and with local storage of different natures (e.g. thermal) by using standard communication protocols. 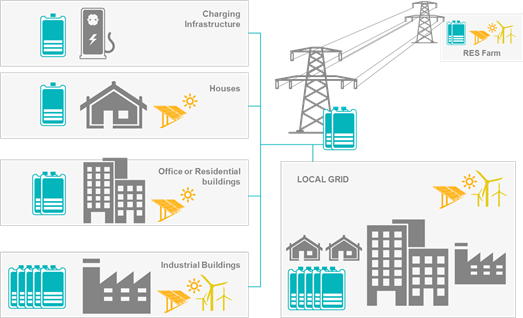 The BEMS coordinate generation, storage and loads to provide a building storage system (including demand response) able to interface with other energy managers (e.g. aggregators, markets or substations).